Unripe Jackfruit, a huge fruit commonly found in tropical climates, has a string like shreddable texture which works great in some applications to make vegan version of meaty meals. 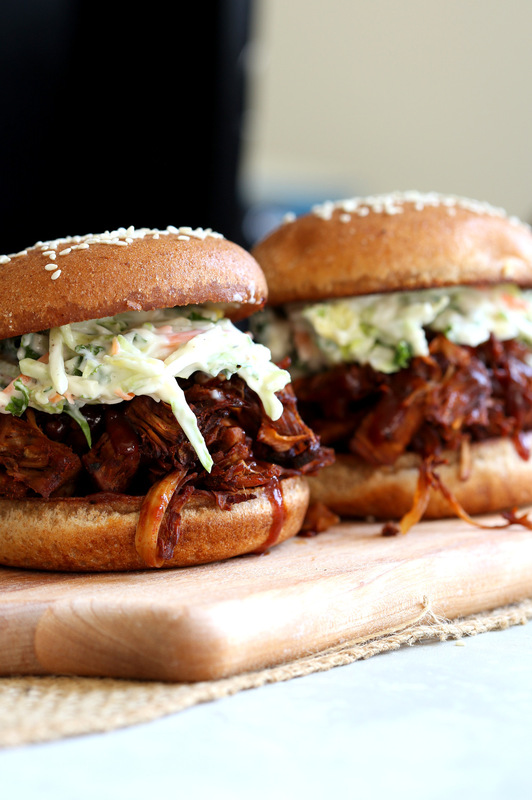 It is often used to make a pulled “pork” to fill up sandwiches or tacos. While trying out my soycurl mango bbq tacos, I felt that this short method of directly baking works out best for me. No additional pans, no additional kitchen standing time! 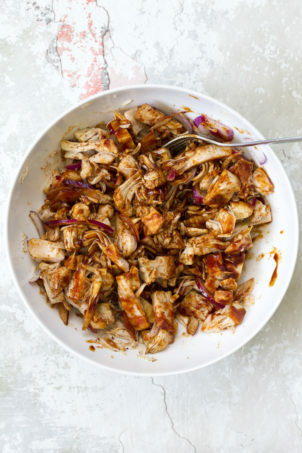 Just shred, mix bbq sauce + seasoning, spread and bake. And done! It cannot be simpler than that! Change it up with different seasonings such as a mix of bbq and cajun, jamaican jerk, taco seasoning etc. This slaw is a basic one with some vegan mayo, pepper, vinegar and sweetener. 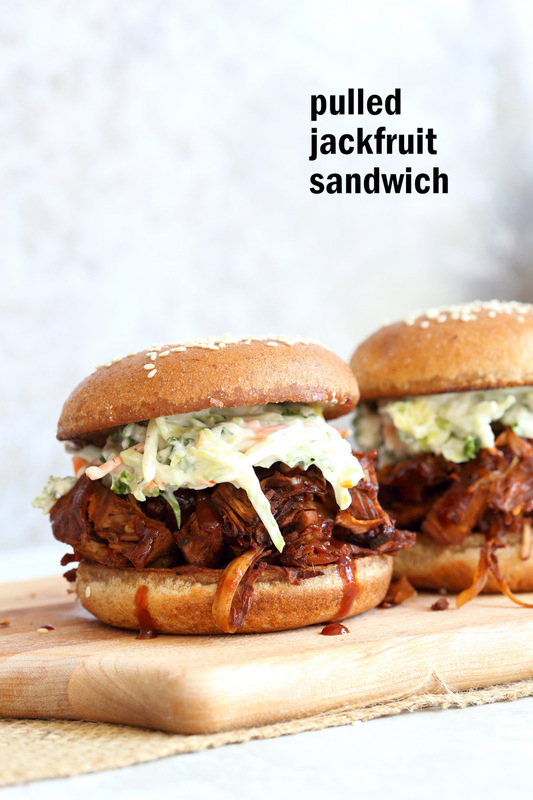 Make a double helping of the jackfruit and add to sandwiches, tacos or wraps! Vegan Tinga bowl with Hearts of Palm, Chickpeas, Spanish Rice – Sub hearts of palm with shredded jackfruit. Jamaican Jerk Jackfruit, Caribbean Bean Wraps. Squeeze the jackfruit in a kitchen towel. Then shred with hands or a fork or knife and add to a bowl with onion, garlic, ginger. Add the bbq spice and bbq sauce and mix. Spread on parchment lined baking sheet and bake. Young green jackfruit texture and flavor can be an acquired thing. Adjust the baking time based on your preference of texture. Add more bbq sauce and bake for less time for moist, and bake longer for crisp caramelized. Jackfruit is available as ripe as well as unripe. Ripe jackfruit is packed in syrup and is sweet. We need green unripe jackfruit here. It can be found in Asian stores, Indian stores and online on amazon. I make my own bbq seasoning/rub. The other seasoning I like is from world spice which is just spices. So use 2 tbsp and add a tbsp of sugar. You can also add a bit of liquid smoke for smokey profile. You want to squeeze the jackfruit as much as possible to remove the brine flavor. Then mix and marinate for a bit if you wish in the bbq sauce + seasoning. Add a bit of broth for additional moisture if needed, then bake. Drain the jackfruit. Place in a thick kitchen towel, fold and squeeze out as much liquid as possible. This will shred some of the jackfruit. Slice the rest using a knife or separate using hands until somewhat shredded. Remove any hard seeds if any (There are rarely hard seeds in the canned version. The tender seedbox and stem area are all edible). 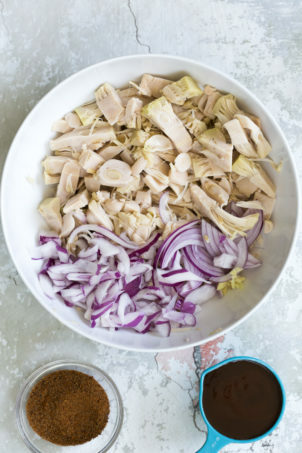 Add the jackfruit to a large bowl with sliced onion, garlic and ginger. Add bbq seasoning and sugar mixture, and salt and mix well. Add 1/2 to 2/3 cup bbq sauce and mix. Add 2 tbsp veggie broth if the bbq sauce is too thick and mix in (I use 2 tbsp of broth to clean out the mixing bowl after transferring to the baking dish). Spread the mixture in a large baking dish (parchment lined). Bake at 400 deg F For 30 minutes. Shred some of the larger pieces by pressing with a spatula. Taste and adjust salt, sweet, heat at this point. Add some salt, sugar/maple syrup and cayenne for heat if needed and mix in and move the jackfruit around. Prepare your buns tacos and slaw. Mix everything under slaw. Taste and adjust flavor. Chill for 15 mins and use. 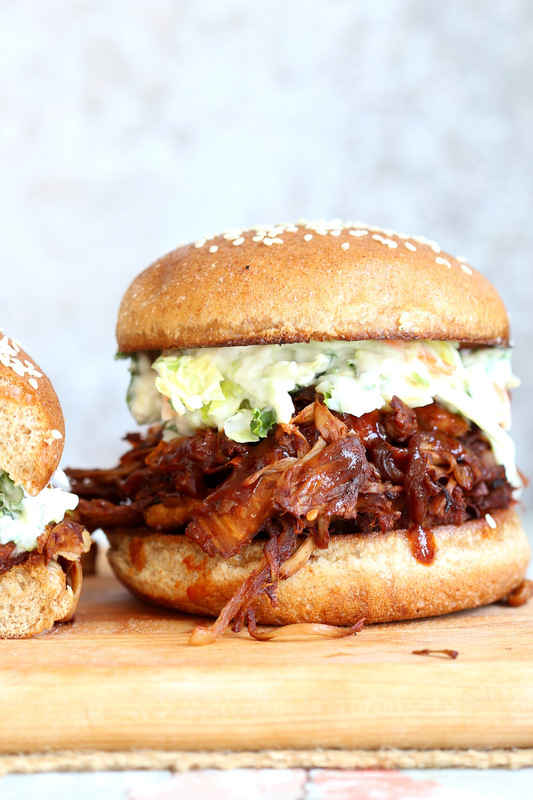 Mix in 2 to 4 tbsp bbq sauce into the baked jackfruit and assemble the sandwiches with generous layers of jackfruit, more bbq sauce, slaw. You can also fill this in wraps or tacos. Nutrition is for 1 serve (1 sandwich) does not include bread. These look great! I was pleasantly surprised to find these on the menu of a small town restaurant in Michigan, of all places. It was the only vegan thing on their menu. I love it now, but it’s definitely an acquired taste! I think they’re better the longer they cook. yes i dont like the texture when cooked onthe stove top. 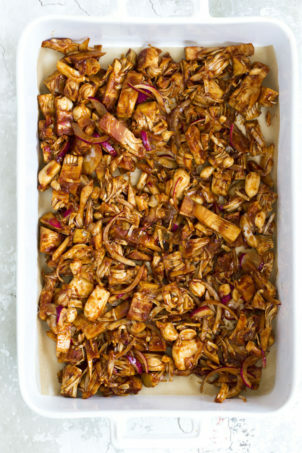 The baked caramelized jackfruit is so much better! I agree, if it is not prepared properly, it is an acquired taste. However thorough rinsing of the jackfruit and you CAN make it taste EXACTLY like BBQ pulled pork. I’ve had it made ‘right’ and I’ve had it made ‘wrong’. I sent it back when they get it wrong. Rinse rinse rinse the pulpy fruit! what about using fresh jackfruit? I have noticed it on sale in my neighborhood but never cooked with it. would it work with this dish or other dishes of yours ? how woudl it be different? yes definitely.You just wont need to squeeze it. If the fresh jakfruit is already peeled and hard stem removed, then just Shred and use! The only thing with the fresh jackfruit is that it is usually ripe and then it is sweet and has an apple/ mango flavor. I don’t like that in my savory dishes but maybe try both. Thank you Richa! I really didn’t like it on the stove top and am grateful for your baking insights! I’ve had it prepared and it was perfect but making it myself has been a learning curve! Thank you! Hi Richa, I have a jar of jack fruit at home, but I will have a look if it’s in syrup or water. If I convert it with your metric, is it correct that 2 20 oz is 40 cans of jack fruit? That seems to me like a lot…. If I use a converter on Google, it says it’s around 60 ml? Hi! We are replicating this recipe bit with a whole fresh jackfruit. How do we measure the seasonings? Do we go add the specific measurements by each pound of jackfruit? This was a fun new try for us. Jack Fruit Wow! Our family thought this was an excellent recipe. The coleslaw is a perfect addition – don’t skip it! This turned out to be delicious. Thanks for the recipe! I’ll make it again. Can you share your BBQ seasonong recipe or did I miss it here? Richa, check your wording about adding the sugar. I think you meant add 1 T sugar if already has sugar and vice a versa? Cant wait to try. Have 2 cans sitting on the shelf. Hi! How many people will this recipe serve on average? 2 to 4 depending on their appetite and what you are serving as sides. Just cooked this and it was the first time I cook with Jackfruit – way too simple, I don’t know what I was worried about! And the recipe is on point, tastes amazing!! I’m definitely making this again – and again… Thank you! yay! i know right, no simmering for hours needed! I just saw this comment now. I’ve always hated recipes with jackfruit, but this one inspired me. And I live in Michigan! Curious – in what small town did you get the jackfruit sandwich? Thanks! 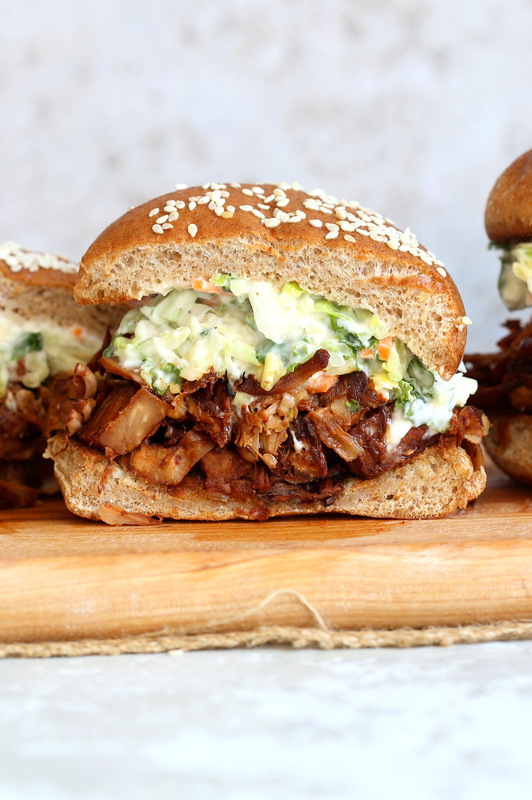 These jackfruit sandwiches were so flavorful and the texture was on point! 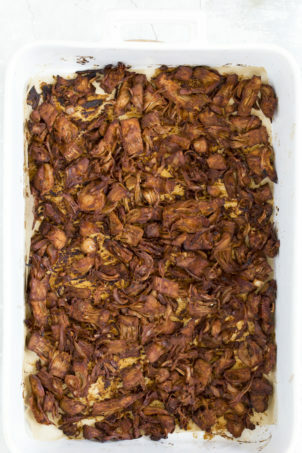 I’ve always wondered if baking jackfruit would give it the texture I prefer, and this recipe proved it would. This recipe is a keeper! This sandwich was delicious. I will definitely be making again. My husband like so much he ate 3 sandwiches. Thanks for the recipe. Absolutely amazing ! So simple. Thank you Richa for this recipe and for including a link to your BBQ seasoning recipe and the dressing for the coleslaw. It all turned about perfectly. My husband wanted seconds. This will be a new meal in our house. To shred the jack fruit I threw it in the food processor with the S blade and it worked great, just pulse. I used HAK’S Habanero Pineapple BBQ sauce, I usually like to make my own, but sometimes cutting corners is necessary. Thanks again!! !